The most significant improvement is the consolidation of all navigation into the left menu – whatever you’re looking for, it is here. 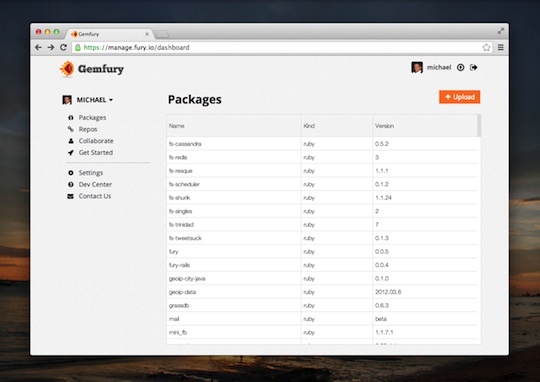 Each tab corresponds to a distinct purpose with which you may visit Gemfury: to upload or delete packages, to connect to your repository, or to update any other part of your account. Collaborating across multiple accounts is not an afterthought – easily switch your context by using the accounts drop-down at the top of the left menu. Managing collaborators and permissions for your account is still a familiar part of the Collaborate tab. One of the most frustrating deficiencies of the old dashboard was the lack of browser history and deep linking. This is now fixed. The back button works, and for every location in the dashboard, you can now bookmark or share the link to return directly to that page later. We’re really excited to launch these and many other improvements with this update, and we look forward to your feedback. If you already have a Gemfury account, go ahead and switch to the New Dashboard now. If you’re new to Gemfury, it is on by default for all new customers.